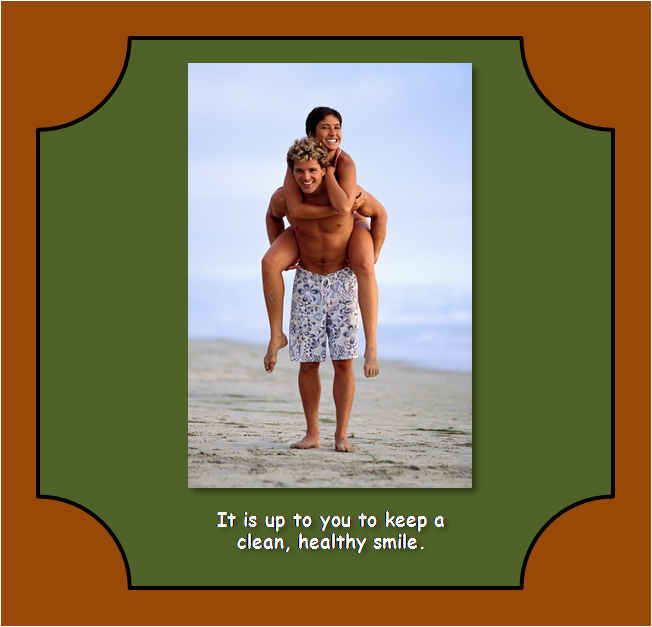 A bright smile with fresh breath - that's what a healthy mouth means. It also means you can talk and laugh with confidence. FACT 1: You have not outgrown tooth decay. In fact, dental decay may be more of a problem for you during the teen years than it ever has been before. FACT 2: Gum disease (gingivitis) is a risk to your dental health. It is also a threat to your appearance. Gum disease causes red and swollen gums, bleeding gums and bad breath. FACT 3: You will have all your permanent teeth with the possible exception of your wisdom teeth (third molars). During these growing years, your face and jaws will undergo many changes. You can be healthy and attractive through these changes by taking good care of your teeth and visiting your pediatric dentist. Do not smoke or chew tobacco! The warnings that you hear and read about are true. Besides lung and heart problems, tobacco can cause oral cancer, as well as a host of other cancers. Of all cancers, 2.4% occur in the mouth, and tobacco use has beenn estimated to account for over 90% of cancers of the oral cavity and pharynx*. If you are using tobacco and notice any changes in your mouth, contact your doctor immediately. 1. Do you weigh yourself more than once a day? 2. Are you obsessed with being very thin, even while you are below a normal weight? 3. Do you have a fear of not being able to stop eating? 4. Do you vomit after a meal  or have the urge to do so? 5. (For females only) Have you missed three consecutive menstrual periods? 1. Be careful of between-meal snacks. 2. Clear the snack from the teeth as soon as possible. Even a simple swish and rinse with water will help. 3. Do not let snacks take the place of nutritionally balanced meals. Dentistry for adolescents and teens is a fundamental part of the advanced training of the pediatric dentist. 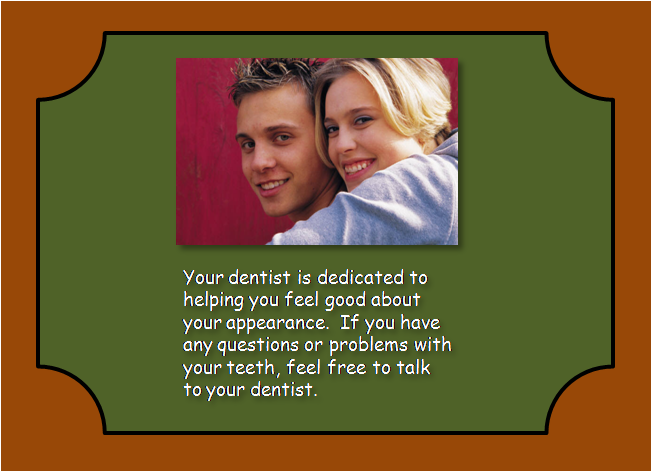 Your dental health and appearance are as important to you and your pediatric dentist. Let us keep your smile sparkling and healthy. However, please understand that if you have dental issues that are outside of the scope of your dentist's normal practice you may be referred to another dentist who can meet your needs. 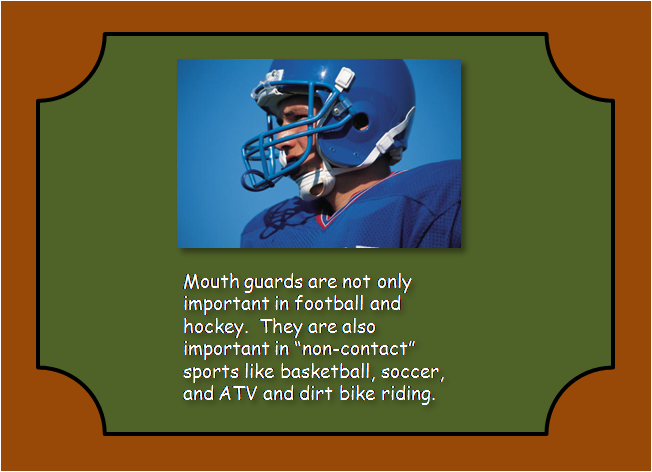 Your pediatric dentist and the American Academy of Pediatric Dentistry hope this information is useful to you. Please share this with a family member or friend.